"You look like a friendly crowd!" Samuel Goldywn Films recently debuted this official trailer for the new horror thriller titled Psychopaths, which first played at the Tribeca Film Festival earlier this year. This is also the latest film from Mickey Keating, director of the films Ritual, Pod, Darling, and Carnage Park, which was also released this year. Psychopaths is about seven different serial killers whose paths cross over one single, blood soaked night. This looks flashy and stylish, though it's hard to tell what exactly is going on in this trailer. The ensemble cast includes Ashley Bell, Angela Trimbur, James Landry Hebert, Jeff Daniel Phillips, Jeremy Gardner, Ivana Shein, and Larry Fessenden. If you're into indie horror, and masks, and serial killer films, then this is for you. But if you're not into that, well, maybe not. Have fun. The paths of multiple serial killers cross over one single, blood soaked night. Which psychopath will survive through to morning? Follow the soul of a recently executed serial killer as he descends back to earth and possesses his many followers beneath the full moon. There’s Alice, an escaped mental patient who thinks she’s living in the 1950s glamour world, Blondie, a beautiful seductress who lures men down into her suburban basement, the Midnight Strangler, first seen claiming a victim in a seedy hotel, and an enigmatic masked contract killer who stalks the city with his own deadly agenda. 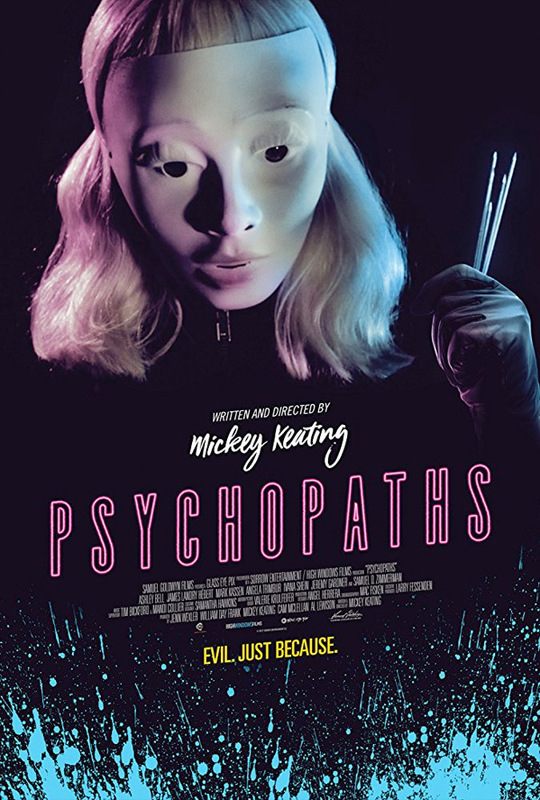 Psychopaths is both written and directed by American horror filmmaker Mickey Keating, of the films Ritual, Pod, Darling, and Carnage Park previously. This first premiered at the Tribeca Film Festival earlier this year. Samuel Goldwyn Films will release Psychopaths in select theaters starting December 1st later this fall. Thoughts?